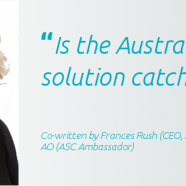 Home » Feature articles » Is the “Australian solution” catching on? Is the “Australian solution” catching on? The following article was written by Hugh Mackay AO and Frances Rush (CEO, ASC) and appears on John Menadue’s blog. “The US president is indifferent to human rights.” That was the banner headline on the front page of France’s Le Monde newspaper last week, as if it were news. Donald Trump has amply demonstrated that indifference, and not only in the context of his fantasy wall along the Mexican border. But he is now being joined by the new Italian government and by the growing body of populist and right-wing agitators across Europe. Demonising refugees and people seeking asylum has become a favourite tactic of fear-mongering politicians who know that a certain wariness towards strangers (particularly those of different ethnic or religious backgrounds from our own) is a natural human tendency that can easily be ramped up to a “wall” mentality. Australian politicians on both sides of the parliament have become past-masters at it. Tony Abbott, when prime minister, was even prepared to offer the Europeans his advice about how to “stop the boats”. President Trump, in his infamous leaked phone conversation with Malcolm Turnbull, said of Australia’s asylum-seeker policy that “you’re worse than we are” – and he meant it as a compliment. So have we become the standard-bearers for this latest version of “man’s inhumanity to man”? Not so fast. It’s precisely because xenophobia is a natural human response to otherness that people in any setting can find themselves driven by that dark impulse. But civilisation is all about learning to resist our dark impulses; learning, instead, to enshrine and respond to our noblest impulses, such as compassion. Ah, compassion. Give in to that and the floodgates will open, say the supporters of indefinite offshore detention as a deterrent to people smugglers. People will drown at sea! Amazing, isn’t it, that the combined intelligence of the entire federal parliament can’t come up with a better strategy for ensuring the safety of people seeking asylum than brutal punishment of the innocent. Prediction is a mug’s game, but one prediction can be made with total confidence. At some point in our future – though certainly not in the life of this government nor the next – there will be a national apology to the people seeking asylum whom we have so harshly treated, both offshore and on. The apology, when it finally comes, will acknowledge that we treated these people as if they had done something wrong – even “illegal” – though we always knew they had not. (They had simply exercised their rights under international treaties to which we are a signatory.) It will acknowledge that what we did amounted to torture. It will also acknowledge that, unlike the scandal of the stolen generations of Indigenous children, or the sexual abuse of children by priests and others responsible for their care, we all knew this was going on, year after year, and chose to do nothing about it. We found it easier to ignore than to confront and, to that extent, we were all complicit. When we talk about people seeking asylum, we tend to focus on the notorious offshore detention centres on Nauru and Manus Island, but that is merely the tip of the iceberg of our national heartlessness. Why is there so little public discussion about the treatment of people who are living in our community, awaiting confirmation of their refugee status? The continuing erosion of government support threatens those people with destitution. Only last month, a group of people who had been medically evacuated from Manus and Nauru were advised that they would lose all income support (less than Newstart, by the way). Single people lost that support overnight and were given three weeks to vacate their current accommodation. Families were granted a further six weeks of income support and advised that by the end of that period they, too, would have to vacate their accommodation. This week the Department of Home Affairs began a roll out of income support cutbacks affecting single people over the age of 18 and under the age of 70. This group of people will lose all income support from mid July this year giving them 4 weeks notice to find a job. Employment is certainly the game changer for any refugee, and while people seeking asylum have shown great courage and resilience in fleeing their country and finding their way to ours, we shouldn’t underestimate the challenge of trying to find work, learn English, find secure accommodation, while living with uncertainty about your very status as a refugee. Fortunately, the wellsprings of compassion and generosity run deep in this community. While governments of both persuasions have shown blithe disregard for the views of ordinary, decent Australians (a large majority of whom are opposed to indefinite offshore detention of people seeking asylum), the Asylum Seekers Centre in Sydney is regularly overwhelmed by offers of help. Students, pensioners, business and professional people … people from all walks of life offer their time, skills, financial and other resources to assist in the care of people seeking asylum. Such sustained support amounts to a protest movement that exposes the yawning gap between community attitudes and government policy. The impact of the government’s heartlessness on the mental and emotional state of people seeking asylum can scarcely be imagined. But that’s not the only impact, of course. The longer this goes on, the more we ourselves are diminished by it. What does it say about us that we have become the kind of society that would inflict such unconscionably harsh treatment on innocent people who have simply sought a better life in a safe society where, like so many before them, they are keen to make a contribution? There’s plenty to apologise for. But an apology without reparation is a pretty hollow thing. So here’s another confident prediction: our humiliating national apology will be followed by compensation payouts that will rival the payments now being made to victims of child sexual abuse. That won’t heal the wounds we have inflicted on many thousands of the world’s most vulnerable people. But at least it will be a tangible acknowledgement of the fact that we got it grievously wrong – and never more grievously than in 2018. Hugh Mackay is a patron of the Asylum Seekers Centre in Newtown, and the author, most recently, of Australia Reimagined. Frances Rush is CEO of the Asylum Seekers Centre.